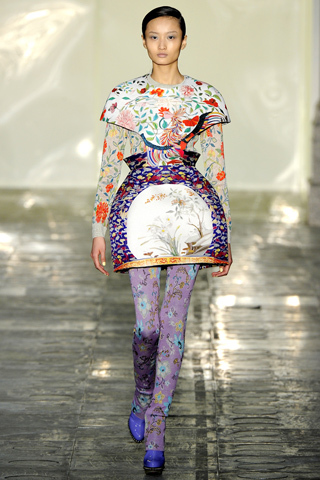 Just in case you were wondering if prints are in for fall 2011, just ask London-based designer Mary Katrantzou. Her prints, many of them head-to-toe, visually exploded on the runway at London Fashion Week. Each piece of this collection is exquisite in its thought and detail. The use of photographic images on bias cut dresses is innovative and, frankly, mind-boggling. 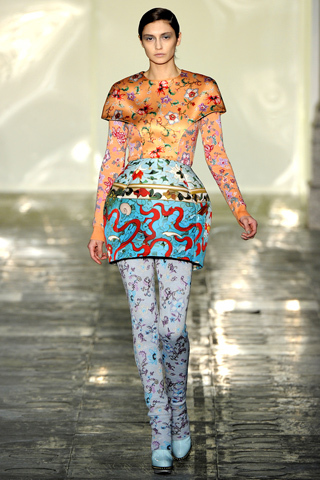 How does Katrantzou get an image to read understandably when it’s placed on a drapey bias cut? While each piece is gorgeous, the head-to-toe looks do sometimes resemble an English country cottage that exploded, with only the living room upholstery and lampshade surviving – on the hips of a model on the runway. These fabrics are so luscious but does any woman want to add a few inches to her hips? This print is amazing but is she wearing white tabis or white boots? Either way, they don’t do much for the look, do they? 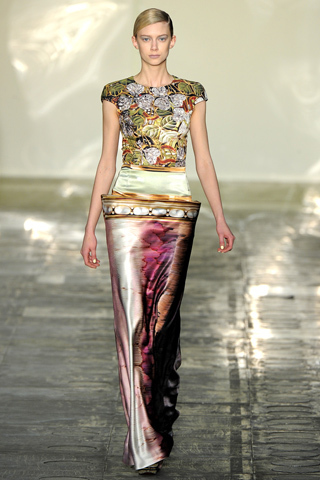 Katrantzou’s prints truly define the concept of art to wear. This entry was posted in International fashion, Uncategorized and tagged Mary Katrantzou. Bookmark the permalink.